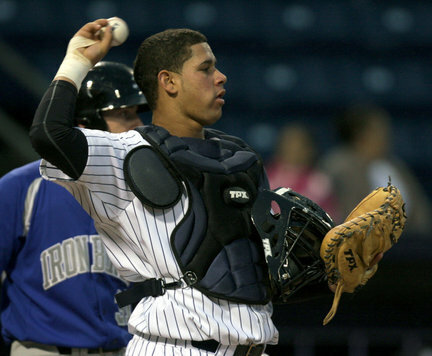 Gary Sanchez has taken over as the top prospect in the Yankees organization. With the July trade deadline having come and gone and the minor league seasons almost concluded, it’s time to sit down and reevaluate the farm system. It’s interesting to look at which prospects have seen their stock skyrocket (Tyler Austin) and which have seen their value plummet (Dellin Betances). The last time we looked at these rankings, just after Memorial Day, I limited the list to fifteen players. For this list, I’ve expanded it to twenty-five players, each of which has a chance to enjoy every boy’s dream of becoming a major league baseball player. Let’s hear your thoughts below on the rankings, where the system is strong, and where the system is weak, because when it comes to ranking the prospects, everyone has their own opinions. For me, I rank based on a combination of current talent level, star potential, and bust potential, because to me, a top prospect is one with less of a chance to bust. Starting pitching (eight prospects in the top 25) and the outfield (seven prospects in the top 25). The pitching products are currently spread at all different levels of readiness. Some of the pitching products, such as Manny Banuelos and Brett Marshall, are probably in the discussion for a major league roster spot by the end of the 2013 season. However, the Yankees also have guys such as Rafael DePaula, Jose Campos, and Ty Hensley in the lower levels with limitless potential waiting to be realized in three or four years. The outfield doesn’t have as much upper level depth, only Rob Segedin and Cody Johnson have reached Double-A, and Johnson rarely plays the field. However, there are plenty of solid prospects and potential fast movers, such as Tyler Austin, in the lower levels to say that it is a definite strength in the Yankees farm system. The infield (four prospects in the top 25). David Adams is the only infield prospect on this list in the upper levels, and other than a few appearances at third base, Adams has been a second baseman throughout his professional career. Bichette and Gumbs both have potential down in Charleston, but it’s still too early to tell how quickly they’ll progress. As for Austin Aune, the 2012 2nd round pick is extremely athletic, but his future may be in center field, not the infield. Cito Culver was a struggle to leave out, especially after giving him a spot in May. Unfortunately, the bat hasn’t come around in Charleston, and they haven’t tried to branch him out at 2B or 3B. His bat will prevent him from being more than a utilityman. Zoilo Almonte is a switch-hitting outfielder in Trenton who made a stong impression in Spring Training. Had he earned a promotion to AAA this season, he would have made the list, likely in place of Johnson. Corban Joseph may not play the best defense, but he has a plus bat down in AAA. Unfortunately for Joseph, he also plays the same position as Robinson Cano. Evan Rutckyj probably could have made this list, but I’m a bit worried about his reliance on striking hitters out. I don’t know that he’ll be able to overpower hitters in the upper levels as much.